I've always been the type of person to hold onto things. Part of it is sentimentality, part of it is laziness (getting rid of things takes effort), and part of it is worrying that I'll need it for a future date. It wasn't until I was packing to move for the first time, though, that I realized how much objects hold memories. Being materialistic was the sort of thing that was discouraged in the environment I grew up, but I always associated it with the idea of wanting new shiny things and not necessarily holding onto things from the past. The idea of being materialistic about objects because of the way they hold memories and acquire their own kind of value was a revelation. 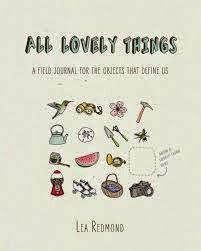 All Lovely Things: A Field Journal for the Objects that Define Us recognizes that truth and encourages you to really look at the things in your life and see them for their meaning, what they are, and spend some time cherishing them by sketching them and reflecting on them. It may seem like a strange idea, but it's actually really lovely. The creator of the book spends some time in the beginning helping you to see how to value your objects and how to see them in your life and then the book opens up to pages that allow you to put it into practice. This is the time of year where we're thinking about spring (well here it's 90 degrees here so I'm actually thinking about summer), and starting to clear out our drawers and prepare for lighter days ahead. It's the perfect time to spend some with All Lovely Things. Luckily, the publisher has offered to send one lucky person in the United States a copy of this book. To enter for a chance to win, just fill out the form below.